Le Brusier possesses super-canine strength, allowing her to drag (pull) several tons over long distances. It is unknown exactly how much weight she can lift utilizing her jaw alone. Le Brusier is an exceptionally strong and durable French Bulldog. She is immune to small arms fire, and is capable of weathering superhumanly powerful blows or charging headfirst through stone structures with little to no effect. Le Brusier is fluent in both French and English (though she obviously cannot speak either language verbally). Despite her near human intelligence, Le Brusier is still a dog. She has all of the same physical restrictions that an animal would, and normally reacts to situations in the same manner as any dog would. Le Brusier had been an active “hero” in France for several years when she first came to the attention of the Guardians of the Globe. 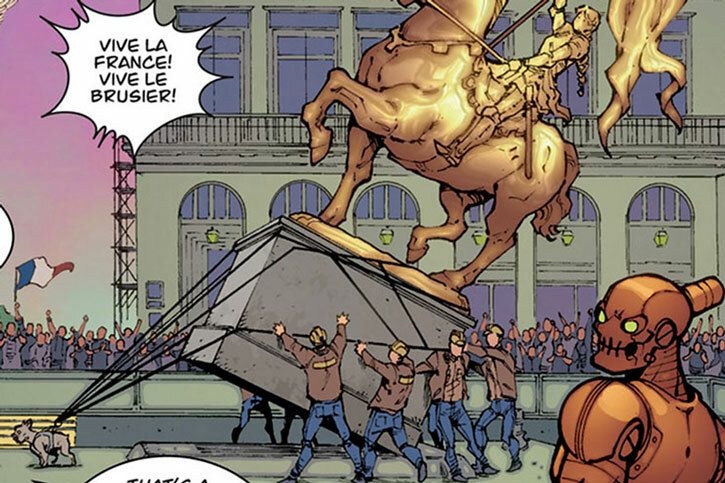 The group was looking to recruit international heroes, and Le Brusier’s physical strength was a welcome addition to the team. Upon joining the team, Le Brusier immediately bonded with the avian heroine Pegasus. The pair have become an inseparable duo since that time. At first glance, Le Brusier appears to be a typical French Bulldog. She is sturdy, compact and extremely stocky with a large broad head. She has a dark muzzle and nose. Her upper lips hang down over her lower lips, and her eyes are a deep brown as well. Her coat is a light brown colour. Unlike other Bulldogs, Le Brusier doesn’t seem to drool or slobber; she is very neat. Le Brusier is a pleasant and easy to care for bulldog. Her intelligence (she appears to be as intelligent as a toddler) doesn’t lessen the fact that she is playful, alert and clearly affectionate. She has an aggressive streak (like all smaller dogs) but takes directions and orders well. Unlike the average animal, Le Brusier is seemingly fearless; she is unafraid of great heights or the depths of the sea. Outside of these specific differences though, Le Brusier is a typical dog. She can be distracted by simple actions (like go fetch, or other dog games) and is still intensely territorial. 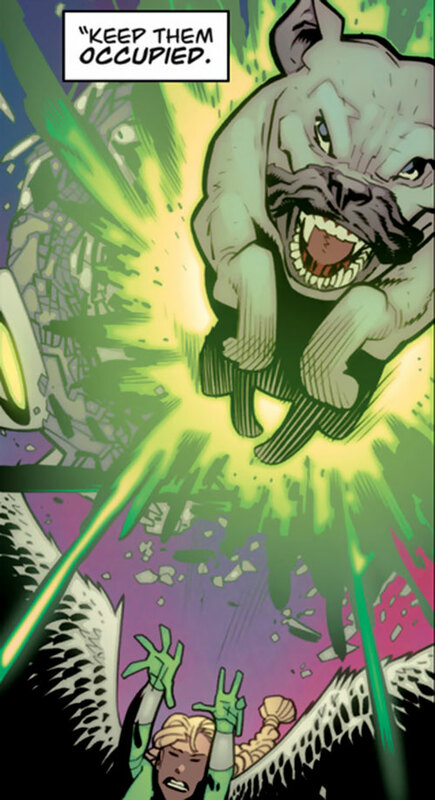 If using Le Brusier in the DCU she could be a 4th or 5th generation descendant of Krypto with correspondingly reduced power levels. 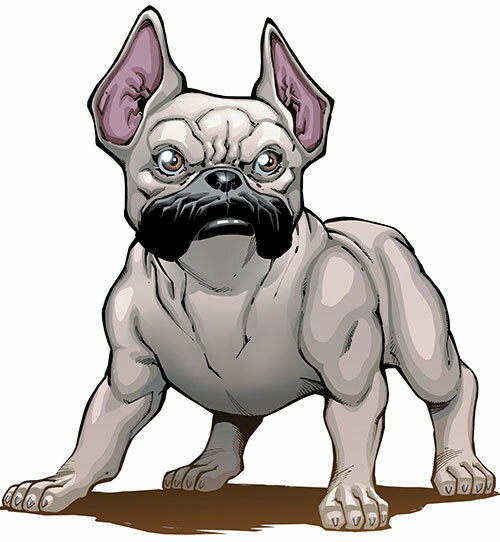 The version of Krypto from the immediately pre- and post-Final Crisis stories shared the angle of having an enhanced but still canine intelligence, though older versions of Krypto had a more human intelligence. Similarly if integrating Supreme into the Invinciverse Le Brusier could have a similar relationship with his dog Radar the Hound Supreme. Additionally Radar’s canine translator collar would be quite handy for Le Brusier and allow her to really communicate with the rest of the Guardians. 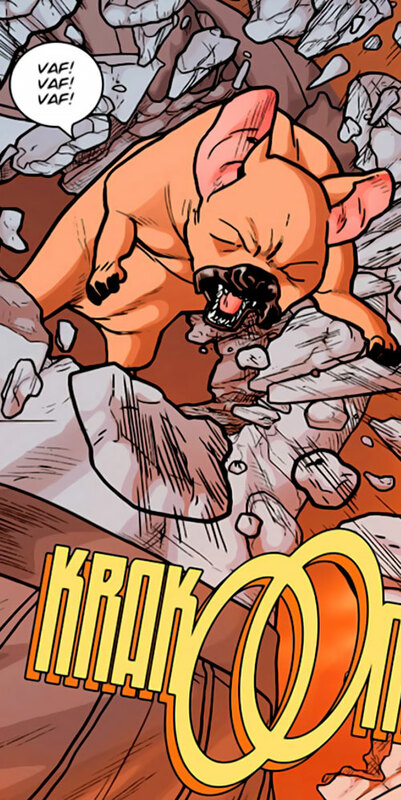 Finally, in my Universe AZ, Le Brusier is most certainly related to Radar and his son Krypto, since Supreme is my Kal’s godfather on Earth he gave Clark one of Radar’s pups when Clark was a teen. 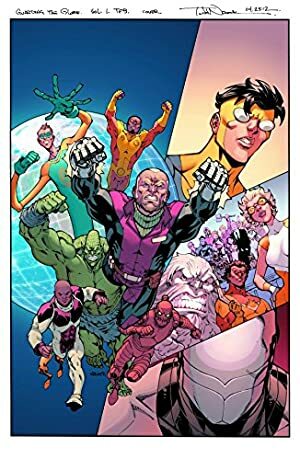 Source of Character: Image Comic Book Series – Guarding the Globe, created by Robert Kirkman (author), Benito Cereno (author) and Ransom Getty (artist/illustrator). Writeup completed on the 16th of August, 2013.